With the except of a few tweets or Facebook comments I have kept relatively silent about politics, but even though I have been relatively quiet I have been listening, watching, and reading. I have been watching parts of the Democratic National Convention and following what people from all parts of the political spectrum have been saying about it. While some diehard Trump supporters and former Bernie supporters who are pissed off that Bernie is more of a realist than them, I can only say that what has transpired in Philadelphia was 180 degrees different than that of the Dark Lord Trump in Cleveland. It was inspiring, it was the belief in the America that I grew up believing. As the son of a Navy Chief won served in Vietnam, as well an Iraq war and Enduring Freedom veteran, as a man who began his service during the height of the Cold War, I appreciated tonight. Let me say as a veteran and currently serving Navy man I was proud of what I saw and heard tonight. Instead of a convention that tore down the very ideals of the Declaration of Independence, the Bill of Rights, and the Gettysburg Address and painted an apocalyptic and fearful vision of fear, there was something to be proud about. There was hope, there was real passion and love for the country. There were the words of Khazr Kahn the father of Captain Humayun Khan who was killed serving in Iraq, which were so moving. As a combat veteran the the words of Medal of Honor winner Captain Florent Groberg, and the words of retired Marine Corps General John Allen meant a great deal to me. To see most delegates shouting USA as these men spoke was so different than the way that that same chant was done in Cleveland, instead of a chant of exclusion, it was a celebration of who were are as Americans. Last week that chant was frightening because it accompanied a message that threatened our allies, encouraged our enemies, and demonized other Americans. This week it made me proud. I was pleased to see the Democratic Party return to a being party of liberal progressivism, as well as values, faith, and patriotism. It was a convention that reflected hope and realism. I honestly don’t ask people to agree with me as I believe that all Americans have a right to their political beliefs, and as I have for nearly 35 years I still pledge my life and my sacred honor to do that. 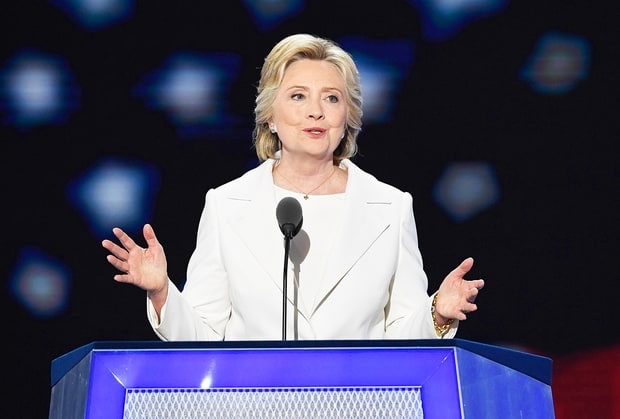 But I was proud tonight, I was proud of another child of a Navy Chief, Hillary Clinton. I head up to Gettysburg again today with yet another class, and I am glad to be doing so. Every time I go I am inspired and rededicate myself to serving. As the son of a WWII Navy Chief, thank you. For some of us formerly staunch Republicans, this terrible thing happened years ago (I voted Libertarian in protest when John McCain chose Silly Sarah as his VP running mate). Other military folks are just working through the pain, loss and the grieving process now, because of the sensed oncoming disaster of this Trumped Out election cycle. Last night was really awe inspiring, to watch the big finish in the Democratic convention. For the first time since this election cycle started, I’m feeling something good start to build. And, it’s a nice word this time…. Amen Bill. I was in tears so many times last night and they came to my eyes again reading your words. Blessings!